Powerful performance poetry. Thought-provoking prose. Speaking Intersections is a dynamic reading of black feminist queer immigrant literature. Speaking truth to power, Lenelle performs original poems, essays and monologues to illuminate the intersection of race, class, gender, spirit and sexuality. (45-minute set, followed by 15 minutes of Q&A with the audience). "Lenelle Moïse examines issues of race, class, gender and sexuality–issues that impact all of our lives–in a beautifully creative way that is all at once funny, sad, provocative, inspiring, and engaging. 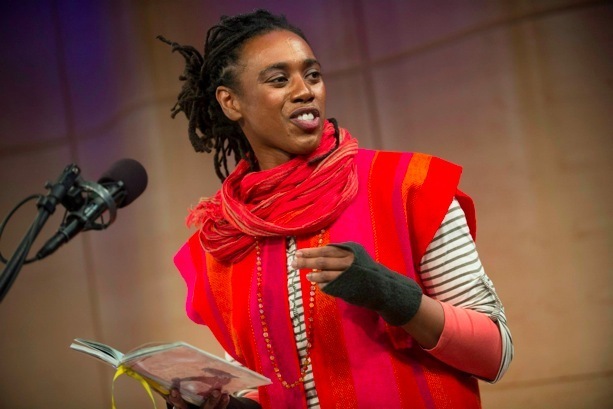 As we work on campus and in our communities to do the hard work of learning from each other and building coalitions to work for social change, Lenelle's powerful performance challenges the audience, with her incisive stories and poetry, to do just that. She is a much needed powerhouse of truth and inspiration."